9h – 13h: Open Sea Practice. 16h 30 – 20h: Theoretical Course. 16:00 – 16:30 Students Welcome (Dr. Xavier Nieto, University of Cádiz). 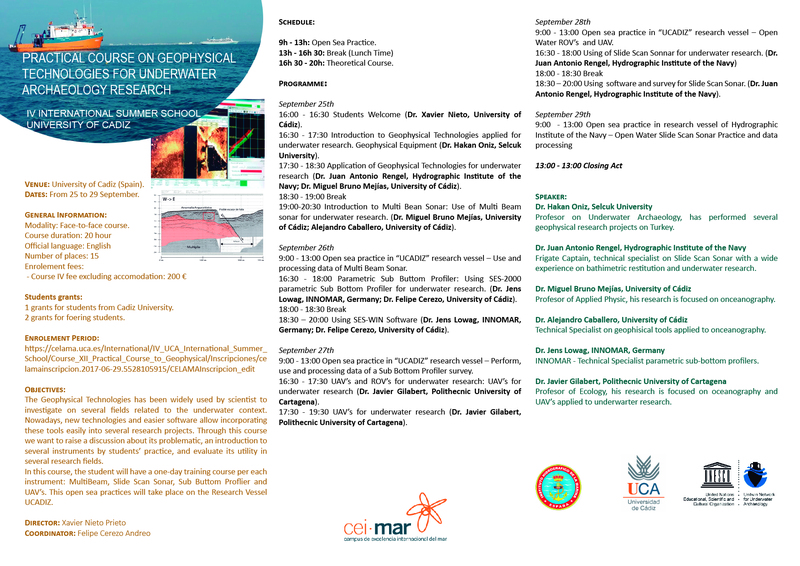 16:30 – 17:30 Introduction to Geophysical Technologies applied for underwater research. Geophysical Equipment (Dr. Hakan Oniz, Selcuk University). 17:30 – 18:30 Application of Geophysical Technologies for underwater research (Dr. Juan Antonio Rengel, Hydrographic Institute of the Navy; Dr. Miguel Bruno Mejías, University of Cádiz). 19:00-20:30 Introduction to Multi Bean Sonar: Use of Multi Beam sonar for underwater research. (Dr. Miguel Bruno Mejías, University of Cádiz; Alejandro Caballero, University of Cádiz). 9:00 – 13:00 Open sea practice in “UCADIZ” research vessel – Use and processing data of Multi Beam Sonar. 16:30 – 18:00 Parametric Sub Buttom Profiler: Using SES-2000 parametric Sub Bottom Profiler for underwater research. (Dr. Jens Lowag, INNOMAR, Germany; Dr. Felipe Cerezo, University of Cádiz). 18:30 – 20:00 Using SES-WIN Software (Dr. Jens Lowag, INNOMAR, Germany; Dr. Felipe Cerezo, University of Cádiz). 9:00 – 13:00 Open sea practice in “UCADIZ” research vessel – Perform, use and processing data of a Sub Bottom Profiler survey. 16:30 – 17:30 UAV’s and ROV’s for underwater research: UAV’s for underwater research (Dr. Javier Gilabert, Polithecnic University of Cartagena). 17:30 – 19:30 UAV’s for underwater research (Dr. Javier Gilabert, Polithecnic University of Cartagena). 9:00 – 13:00 Open sea practice in “UCADIZ” research vessel – Open Water ROV’s and UAV. 18:30 – 20:00 Using software and survey for Slide Scan Sonar. (Dr. Juan Antonio Rengel, Hydrographic Institute of the Navy). This entry was posted in Cursos, Formación, Novedades. Bookmark the permalink.